Researchers have been monitoring Hawaiian monk seals for 40 years, but up until a couple of years ago, they had never seen this behavior — and since then it’s apparently become even more popular. A juvenile Hawaiian monk seal found with a spotted eel in its nose at French Frigate Shoals in the Northwestern Hawaiian Islands this past summer (Photo: NOAA Fisheries/Brittany Dolan). The strange situation started a few years ago when Charles Littnan, lead scientist of the monk seal program, received an unusual email. 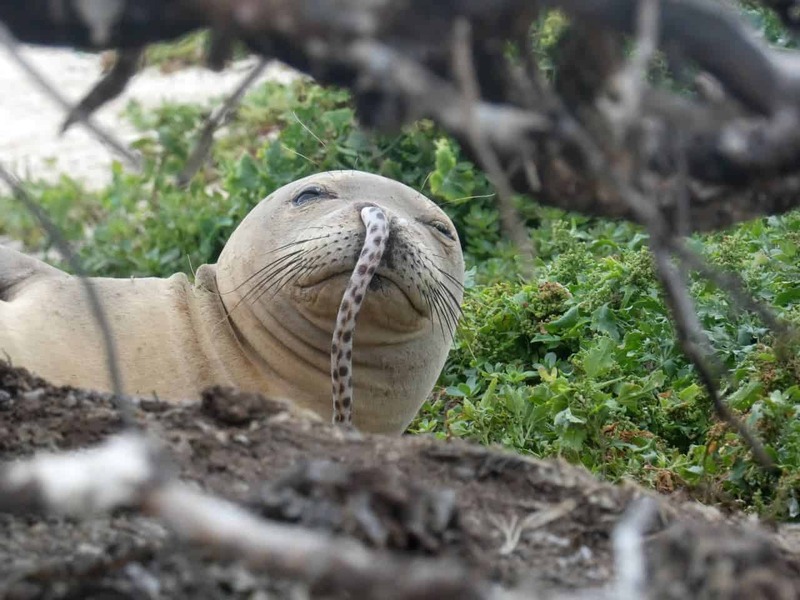 The subject was short, but telling: “Eel in nose.” After a few exchanged emails and phone calls, Littnan realized that there was, indeed, a seal with an eel up its nose, and they weren’t really sure what to do about it. While the eel was no longer living, the seal didn’t really seem too bothered about the situation. Eventually, the decision was made to remove the eel from its nose. After half a minute of pulling, a two-and-a-half-foot eel was removed from the seal’s nostril. The researchers chalked it up to be a bizarre accident and moved on — but then, it kept happening. Not too many times (only 3 or 4 sightings), but sufficient enough nto rule out an isolated accident. The fact that this was never reported until recently, and that it was only happening to juveniles, was even more puzzling. In all cases, the eels were removed and the seals did just fine — although the same couldn’t be said for the eels — none of them survived. As for an explanation, however, there is none. Several theories have already been ruled out. The islands are remote and visited only by biologists, so it couldn’t be the hand of a malevolent human. The seals’ nostrils also shut when they are diving for food (which can very well be eels), and it’s unlikely that an eel would be tempted to jump into the nose of a seal — even as a last resort defence. The other idea scientists were considering was vomiting — like humans sometimes vomit pieces through their nose, the seal may have gulped an eel and then threw it up — but again, it’s unlikely that an eel would have been pushed through the nasal cavity. “This may be a case of an eel that was cornered trying to defend itself or escape. Alternatively, the seal could have swallowed the eel and regurgitated it so that the eel came out the wrong way. We might never know,” NOAA adds. There’s no evidence to truly back this up, but at this point, it’s as good an idea as any. Although the seals don’t appear to be suffering from this, having an eel up your nose can (obviously) be a significant health hazard, either through infections associated with decomposition or due to the fact that the seal won’t be able to properly shut down its nostril while swimming.